See beyond the game, visualize your victoryExperience a superior 27" display with the MSI Optix MAG271C curved gaming monitor. Featuring a 1920 x 1080 FHD Panel, 144Hz refresh rate and unbelievable 1ms response time. Curved monitors allow you to compete at the highest levels with full satisfaction especially with a 178 degree viewing angle. Built with Adaptive Sync technology, the MAG271C can match the display’s refresh rate with your GPU, for the smoothest gameplay imaginable. Experience an Exceptionally Large Display Get the most out of your gaming marathons with the curved MSI MAG271C gaming monitor. Immerse yourself with a stunning Full HD display that surrounds you, making you feel connected to the experience. The monitor panel has a curvature rate of 1800R, which is the most comfortable and suitable for gaming and various applications. MSI large viewing angle monitors allow more options for placing your monitor in your setup without giving up the optimal viewing experience. With 178 degrees of wide viewing angles, colours and details stay sharp compared to other monitors with less viewing angles. fast frame rate & 1MS response time MSI gaming monitors are equipped with a 144hz refresh rate and 1ms response time VA LED panel which has the most benefit in fast moving game genres such as first person shooters, fighters, racing sims, real-time strategy, and sports. These type of games require very fast and precise movements, which an ultra-high refresh rate and fast response time monitor will put you ahead of the competition. Discover Next level realism The MSI Optix MAG271C gaming monitor features a 27” Full HD 1920x1080 resolution that extenuates even finer details while playing the latest games or watching films or videos. The Optix series gaming monitor drives your game textures, characters, and environments to the next level for a more lifelike experience. Switch settings with hotkey optionsControl your curved gaming monitor with MSI Remote Display APP on Android Smartphone, this enables you to control the contrast ratio, brightness and black equalizer, etc., straight from your Android phone. Switch settings with hotkey options With the Gaming OSD (on screen display) app it is very easy to setup your gaming monitor. You don’t need use the buttons on the monitor and go through all the menu’s, just use your Keyboard and Mouse to configurate your monitor. The app even gives you hotkey options so you can switch settings between different games with ease. From Edge to Edge With a super narrow bezel, enjoy the best immersion possible in the latest games with a multi-monitor 180 degree setup. Enjoy better continuity between screens while playing games, working, or general computing. 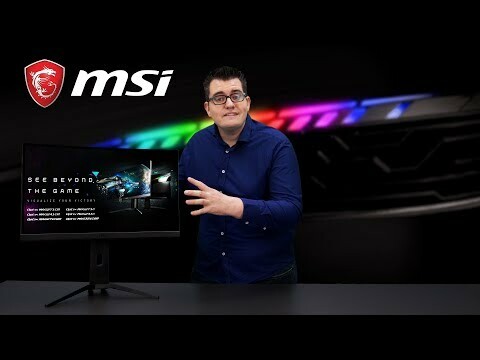 PROTECT YOUR EYES FROM HARMFUL BLUE LIGHT MSI gaming monitors are optimized to reduce eye strain, specially designed to help your eyes from blue light damage by cleverly reducing the total amount of blue light displayed by the monitor. Ensuring that you can game for longer periods of time without fatigue. Smoother Gameplay per Second Generic monitor displays normally have a flicker-rate of about 200-times per second, which is unnoticeable to the naked eye, but can cause fatigue over time. MSI Anti-Flicker technology provides a very comfortable viewing experience by reducing the amount of flicker. Headset easy access Keep your headset in a easy to access space with the built-in headset hanger. Game on and be fully immersed at a moment's notice. 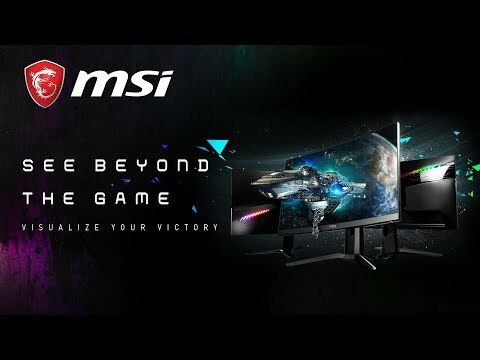 Enjoy lag-free visuals MSI Gaming monitors are built with AMD® FreeSync technology to create the smoothest visuals for your gameplay. To do this, AMD® FreeSync will sync your monitors refresh rate to your AMD® GPU, which helps to eliminate screen tearing or stuttering. Enjoy the game the way it was meant to be enjoyed with ultra-smooth, lag-free visuals. *Note: AMD® FreeSync requires a compatible AMD® GPU to be enabled. Adjustable for gaming marathons The MSI Optix Gaming monitor is designed to enhance your gaming sessions to be as comfortable as possible. With the adjustment to tilt, you can easily change the position of the gaming monitor for maximum ergonomics and optimum viewing.